If you’re a music educator, unless you’ve been living under a rock with your eyes closed and your fingers stuck in your ears, you’ll probably be aware there has been somewhat of a furore over the government’s plans for a ‘model music curriculum.’ When the expert panel for this initiative was first announced, criticism was leveled at its make-up, with many commentators feeling that there should have been more representation from teachers who are currently delivering curriculum music in schools. 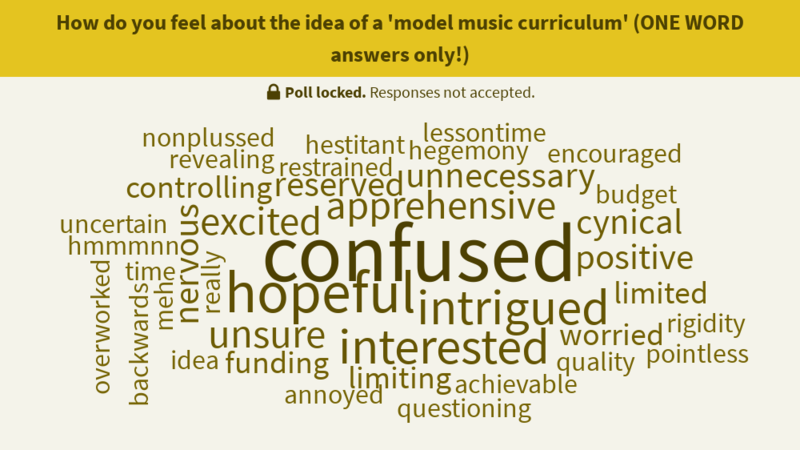 It was at this point in the process that we committed to giving ‘ordinary’ teachers a say by scheduling in a debate on the idea of a model curriculum into the Curriculum Music Conference which took place on Thursday 21st March 2019. We were really grateful to Bridget Whyte of Music Mark for agreeing to receive the results of this debate and deliver them to the panel. You’ll see that the biggest word is ‘confused.’ It soon transpired that many of the delegates hadn’t heard of this initiative – it had completely passed by many of our ‘ordinary’ teachers, despite all the controversy surrounding it. This definitely taught me a lesson about living in a #musiced twitter bubble! However, it also suggested that if this is really such an important initiative, the government has not managed to get that message across to schools. Let’s hope that the message is shared more widely when the curriculum is finally published! While all these questions are fairly moot until we actually have sight of the curriculum, the answers seem to point to the need for resources being stronger than the need for a ‘framework’ that teachers would have to resource themselves. However, it seems that if resources were charged for, teachers would be unlikely to buy in, suggesting that the curriculum needs to be a complete resource, provided for free, in order for schools to adopt it. In the light of this, one wonders if it might actually have been better to provide funding and point schools towards existing commercial curricula with built in resources, rather than reinvent the wheel? As a company which specialises in teacher development, we were interested to know how teacher CPD would fit into this model curriculum plan. Our view, based on 10 years working with primary schools, is that in this phase the problem is not knowing what to teach, but how to teach it. The results of our poll could bear this supposition out, depending on which group you add the ‘maybes’ to! (Secondary teacher responses were also included in this data set, which in hindsight would have been better split into a separate poll, as most secondary teachers are already subject specialists, whereas most primary teachers are not). For the final part of the discussion, we asked the teachers to write down the things they would most like the panel to consider when designing the curriculum. There are far too many responses to display pictorially, but the main themes were these. Time and time again our delegates pointed out that money / cost / funding were the real issues, with many delegates calling for free instrumental lessons to be brought back for all pupils, to halt the decline in take-up for GCSE and A Level. Delegates also strongly called for music (rather than the model music curriculum) to be made compulsory in all schools including academies. There was also concern around whether the curriculum would cater for the needs of SEND pupils, and for the needs of non-specialist teachers, and a hope that it would be based on ‘real’ classrooms not ‘ideal’ classrooms, with enough inbuilt flexibility for teachers to adapt it to their circumstances. Diversity was also a key theme, with teachers keen that the new curriculum should provide a real spread of genres and traditions, and the teachers also felt that the curriculum should be delivered through practical work not theoretical study. The full answers to of all our questions have been sent to the panel for discussion, and we hope they prove useful during the process of designing the curriculum, which is due out in draft form next month.